It's almost hard to believe all that's happened since July. Shortly after my last net worth overshare, I was hit with a job layoff. My first reaction was to escape to cooler weather (hello, Massachusetts!) and drown my sorrows in all the lobster rolls my body could comfortably ingest. 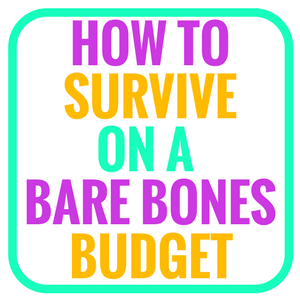 Then, I went into bare bones budget survival mode, slashing expenses wherever possible. This meant making tough decisions. Luckily, my company offered a severance that covered my expenses just past the end of August. But the past two months were expensive! 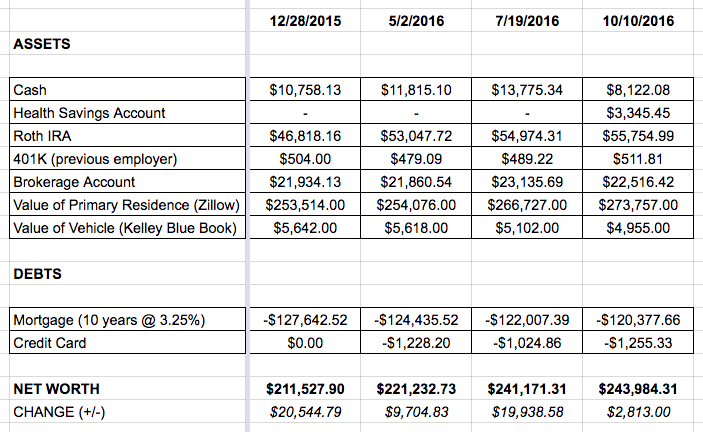 Last year, I started using Personal Capital to track my net worth. 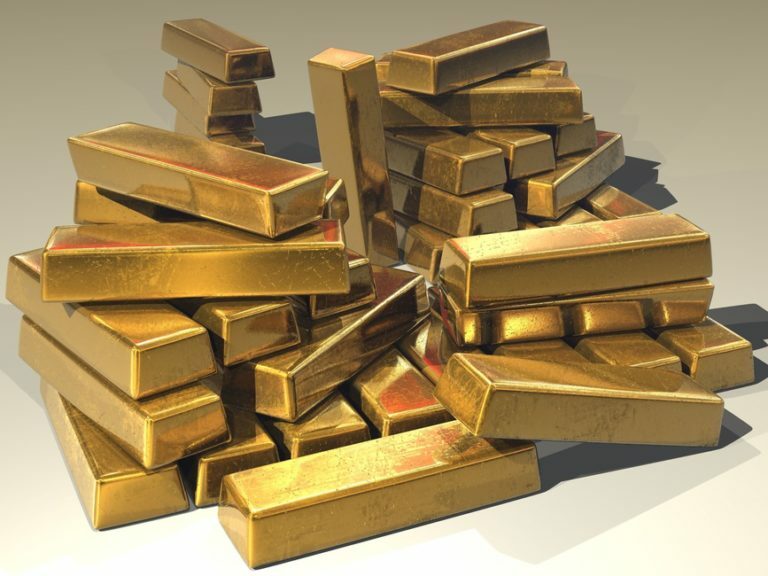 Personal Capital seamlessly tracks your expenses, income, asset allocation, investment fees, and more. I love seeing everything in one place. Plus, it's free! After the layoff, I resisted the urge to fall into the scarcity mindset. Because I was attending XYPN16 and FinCon in September, I didn't immediately pursue new freelance clients. I focused on current projects, organizing my finances, taking care of my health, and preparing for these conferences. This meant dipping into my emergency fund for the past two months. But I've picked up some exciting new clients, and I'm back on track for October. Curious how I'm earning money? 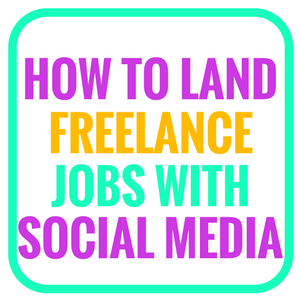 Right now my income comes from freelance writing, social media consulting, marketing, blogging (advertising, sponsored posts, affiliates), and dividends. As I mentioned, August and September were super expensive. It's a coincidence so many planned expenses hit right after the layoff. Luckily, I had been saving for many of them — like car expenses — monthly. I strategically took advantage of my old health insurance by finally scheduling things I had been putting off. I visited the eye doctor, dermatologist, and had some blood work done. Look, no one likes dental surgery. But paying for it out-of-pocket 100% makes it a lot more painful. My cash took a $2,307.81 hit since last quarter. I spent $5,001.12 more than usual over the past two months, but $2,858.68 was toward my business and future career. I have no doubt the investment will pay for itself quickly. I've been saving a little every day with Digit. It's a handy, free tool that I've automatically saved over $800 with. I love managing my account via text message! Read my full Digit review here. Not going to lie, I'm pretty jazzed about my new health savings account. Currently, my allocation is 25% cash and 75% index funds. But I'm going to try to pay for health expenses out-of-pocket whenever possible. Why? 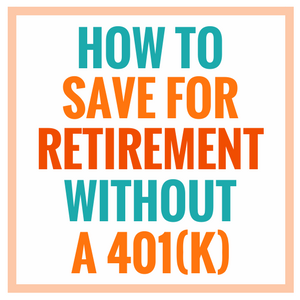 It's like another Roth IRA for healthcare expenses in retirement. Other than this, my investments haven't been very exciting (that's a good thing). Nashville home inventory is still low, so buyers continue to overpay. We're going to see a property tax hike in 2017. I'm slightly concerned for when the city assesses my property from $170,000 to over $270,000. But based on the city's tax calculator, I should only see ~ $1,100 tax increase. Build cash emergency fund back over $10,000. Focus on passing two Certified Financial Planner® classes. Readers: Did you meet your financial goals this quarter? This is awesome Kate! Thanks so much for sharing. It’s great that you were able to overcome the scarcity mindset (such a hard thing to do!). 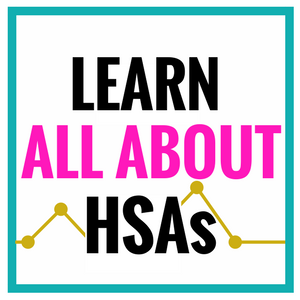 You’ve encouraged me to look into my HSA more. I contribute every month and have been continuing to pay out of pocket for doctor’s visit, but that’s mostly because I keep forgetting to bring along my HSA card to the appointments haha, but in the future I might forget it out of design! And congrats on working to become a certified financial planner! That’s awesome. I’m pretty pumped to use my HSA debit card for the first time next month. Haha. Totally nerding out over the tax savings 🙂 Thanks for the encouragement! Looking forward to meeting you in person soon! Hopefully those conferences will lead to steady work and it will all have been worth it! I’ll be curious about your affiliate class review. I’ve always been terrible at affiliates and have pretty much just given up that…and all advertising at this point. Have a great month! Thanks, Tonya! It’s been great so far. I’m hoping to write a review of Making Sense of Affiliate marketing within the next few weeks. Hopefully you get the income rolling in again soon, Kate. But looks like you’ve done well controlling expenses all things considered. Do you already know your home value is being reassessed that high! That’s crazy. Yeah, my home value has skyrocketed over the past couple of years thanks to Nashville’s growth. I’m just glad I bought in 2009 when it was still affordable. Even renting in my neighborhood would be tough for me right now. Congrats on the increase in net worth despite that cash drop. Being self-employed is so scary yet so rewarding. You seem to be staying very level-headed. That’s great! Thanks, Aliyyah! 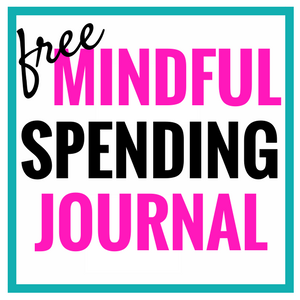 I’m looking forward to following along with your new self-employed journey, too! Thanks for sharing in such a difficult time. 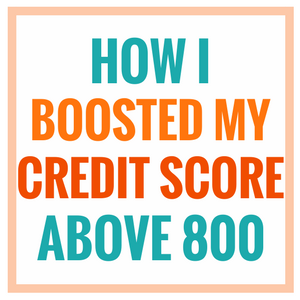 Hopefully you can quickly recover and get the income ball rolling again. 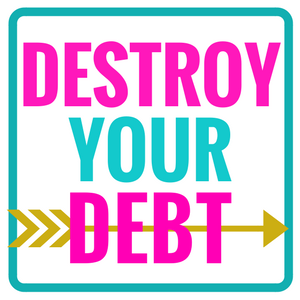 In the meantime it looks like you’ve done an amazing job cutting expenses and haven’t spent too much in the meantime. Keep it up!!! Thanks, Mustard Seed Money. October, November, and December should be much more affordable months. I just need to keep my food & drink budget under control. I’m thinking about trying a 30-day cash budget for that category next month. Congrats! I think you get a big high five for weathering ALL of this so well! A layoff followed by expensive months… and you’re still doing just fine through all of it. Awesome. Though sorry about your big property tax increase next year. Ugh! My HSA is by far my favorite account. Tax deferral & tax free investment growth, combined with reduced medical expenses (at your marginal tax rate). It’s a sweet little account. Here’s to hoping they up the contribution amounts. I hear you on expenses being clumpy and hitting all at once. I suspect life’s just like that: nothing really happens on a regular monthly basis as we’d like it to. Totally agree, Done by Forty! I’ve love to see an increase in both Roth IRA and HSA contributions for 2017. Keep that Roth IRA growing! Thanks, My Money Design! Hopefully I can find a way to max it out again in early 2017 as I have done in previous years. Nice share, you have a lot going on and I am sure it’s a challenge in itself to stay organized and focused, but you seem to be doing a great job. Also, love that you have an HSA now : ) Tax benefits are very nice. So you are taking CFP Classes, eh? Would you want to help manage individuals/families finances for them and to have guides/plans in place? I am very strongly debating the CFP exam next year (I have an MBA in finance + am a CPA), and am curious on what your plan/goal is once you receive the certification? I’m excited as heck for you! I’m really digging my HSA. I geeked out when the debit card arrived in the mail. Haha. My dream is opening my own fee-only, virtual RIA and catering toward the creative niche. The challenge will be meeting the experience requirement after I have passed the exam. I haven’t decided exactly how I will approach that. Thanks for sharing so candidly. Your expenses were up over the last 2 months but I bet FinCon was totally worth it. 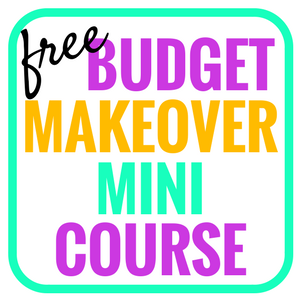 I’m really looking forward to your review of makingsenseofcents.com affiliate course! Absolutely, Graham! I’m keeping track of FinCon and XYPN business. I have no doubt the investment will payoff. Nice work, Kate, and thanks for the behind-the-scenes look. Good luck with the CFP classes. I’m impressed that you have been able to turn a layoff around and design the life that you want to be living instead of frantically looking for another steady paycheck. Thanks for the kind words, Matt. It was a tough decision, but I know another full-time job would get in the way of my long-term goals over the next 6 months. I’m willing to deal with the temporary cut in pay. Sounds like a lot going on. Hopefully the conference expense will lead to some solid connections and future income. Good luck hitting the 4Q goals! You net worth looks great. Have fun with the CFP classes. You will be able to help a lot of people once you’re done. Wow, that’s a big property tax increase. Is there a cap on the increase? That’s pretty crazy. Great question, Joe! I agree that the tax hike is huge. I know elderly have a cap on tax increases. I’m not sure about the rest of Nashville. This is truly awesome post Kate! Such a detailed and brief post. I’m very glad that you overcome all the hindrances and able to become financially stable. I think the problem with those who are financially poor is that they are afraid to try out new things and they always make themselves inferior in the present era. I’m very happy that you are a role model and inspiration to many of us who are trying to become like you. Being financially stable is not a small thing and you achieved it. That is awesome. Thanks for the post and Keep writing great stuff. Nice share, I considered the CFP too, its a little easier now that they changed it and lowered the question amount. Im going to get my EA next year. Ever consider that designation? Well done, Kate. Seeing your blog for the first time. While I am generally not in favor of younger professionals buying a house (you’ll see on my site why! ), in your case, you did a smart thing with a perfectly timed purchase of your house in 2009 when bottom fell through the RE market! This one smart move has probably put you on a firm path for FI. Best wishes! Ouch – that increasing tax bill would really hurt someone like me. I guess it’s hard to get too mad when your properly value is climbing! Nice job on seeing those steady increases in net worth over time even though your going through a rough patch. Keep it up! 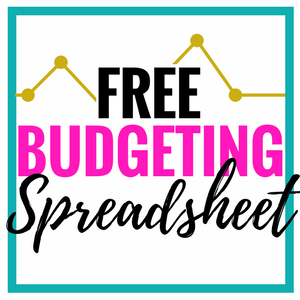 It’s inspiring when i see people who are taking care of their personal finances to save money by cutting expenses or making a list of things they need rather than buying them randomly. This is the problem i face every day, nothing is planned and i end up losing more money than i should have spent on. Now that i have learned many things from your managing skills, i will also maintain list of needed things and also to keep track on expenses that does not hurt my savings. Thank you for sharing your Net Worth and revealing how you are managing your personal expenses.